A tasty and simple accompanying dish. It is similar in some ways to Indian dahl, but it is not spicy. This dish is easy and cheap to make, and so is very common in simple Greek households. Rinse the fava well under cold water. Boil the fava in 1200 ml water in a heavy bottomed pan. Before it starts boiling, remove the froth that comes to the surface with a wooden spoon. When it comes to the boil, add the quartered large onion and simmer for 1 hour, making sure that at least 2/3 of the water has been absorbed. Transfer it to a food processor and blend roughly. Transfer back to the pan and add salt and ¾ of the olive oil. 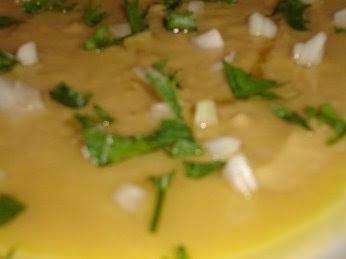 Serve the fava in individual portions in small shallow dishes, sprinkling the parsley and chopped onion on top and adding lemon juice and olive oil.